Thinking back to my own childhood I can still recall playing with the water table in my reception classroom. We’d all wait patiently for our turn in the messy area to splash about, pour cups of water through the wheels etc. Piglet too enjoys this activity, usually refrained to the bathroom, with her baths taking at least an hour to complete. Even then we have to coax her out of there. With the addition of the Little Tikes Sandy Lagoon Waterpark to the garden, she has been making the most of the spring weather. 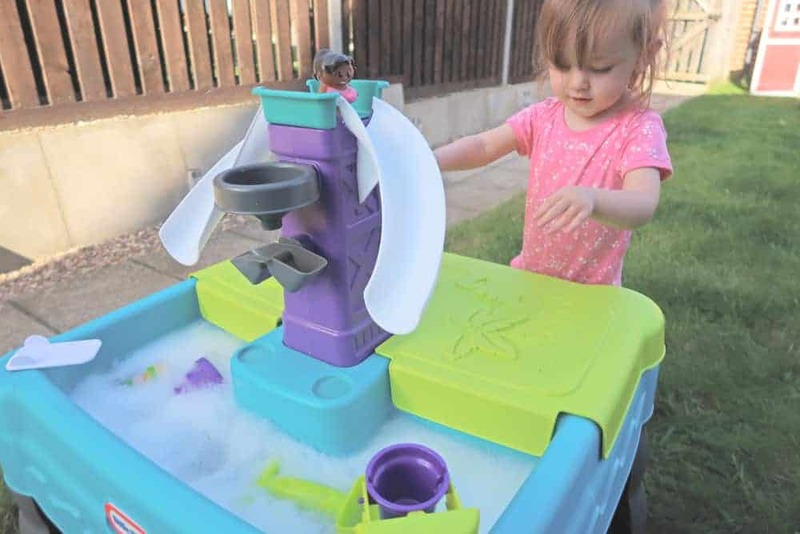 This Sandy Lagoon water table makes your back garden into a miniature water park. 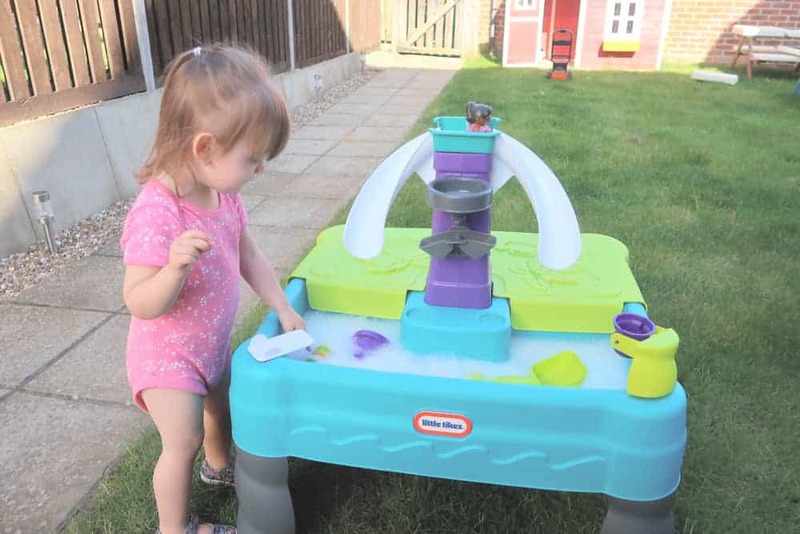 This toy has lots of integrated activities to keep children involved, while promoting hand-eye coordination, active play and social play, making it an excellent sand and water table for toddlers. Kids can experience the fun of sandboxes and the fun of water play right in their own back garden with the Sandy Lagoon Waterpark! 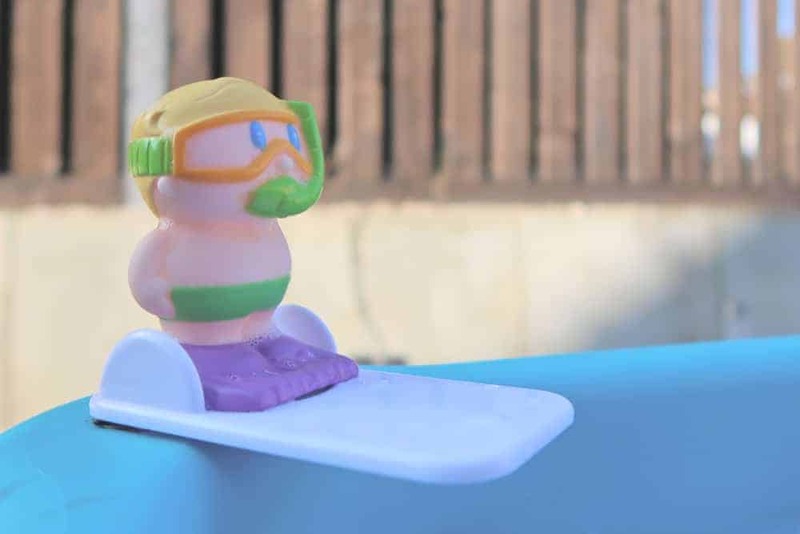 The Little Tikes Sandy Lagoon Waterpark comes flat-packed for ease of delivery/collection. Complete with step by step instructions on how to assemble. This is relatively straightforward, however, a long screwdriver or extension bit is required to reach down the holes in the main tower section. The rest of the assembly is mainly clicking sections into place rather than having to use tools. The Sandy Lagoon Waterpark offers all the fun of playing at the beach or in the bath from the comfort of the garden. 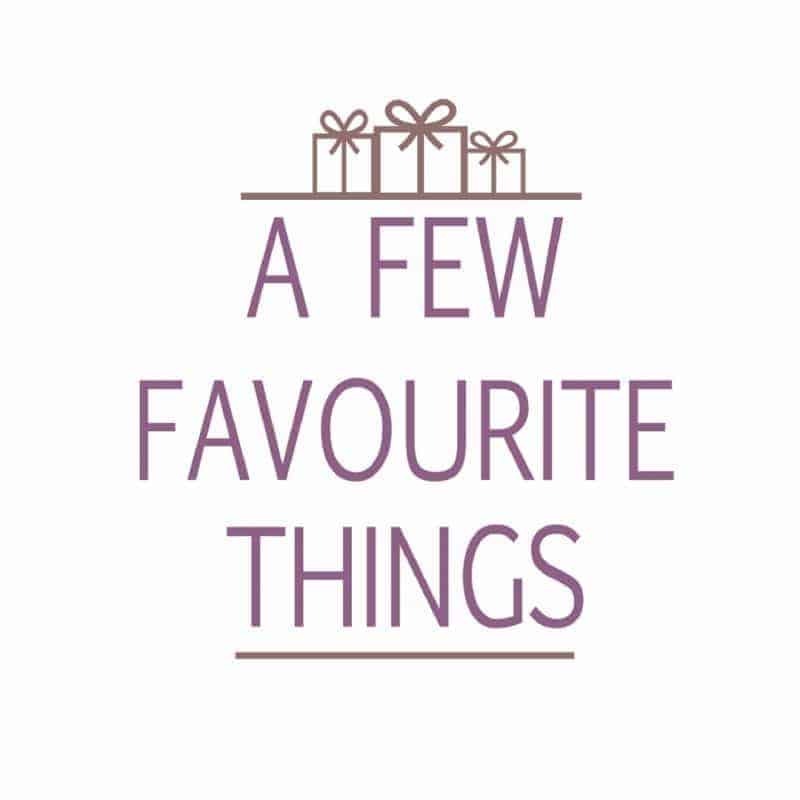 Whether you have a large garden or a small yard, this is a great size to offer water/sand fun without taking up lots of space. The handy cover for the sand area aids in keeping the play sand dry and free from critters. Piglet love bathtime purely for the water splashing fun (rather than actually wishing to get clean). 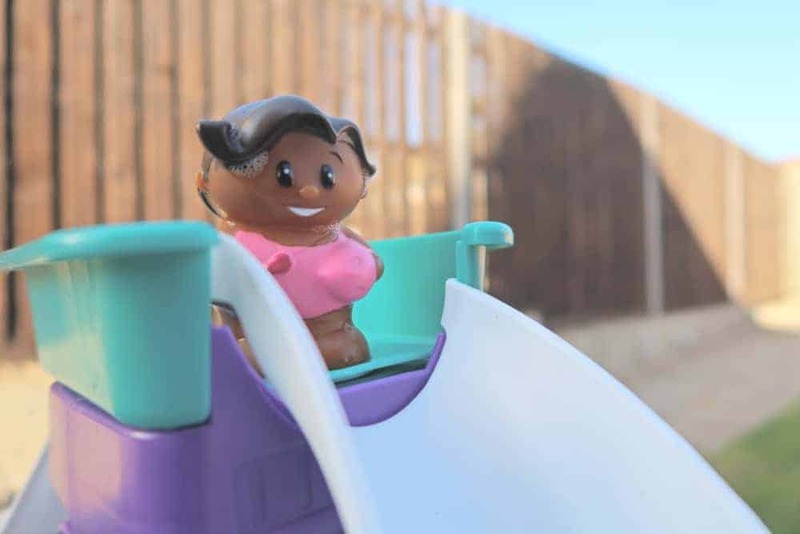 The interactive features on the waterpark have provided her with hours of fun in the garden. Adding bubbles to the water or introducing her bathtime ducks to the waterpark. With the long summer days just around the corner, this is going to be used time and time again. Where can I buy the Little Tikes Sandy Lagoon Waterpark? The Little Tikes Sandy Lagoon Waterpark is available to buy from Amazon and all other good toy retailers.